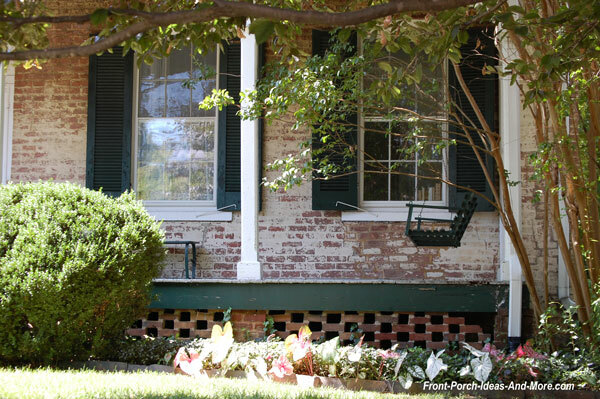 Porch skirting will hide the most unappealing portion of your front porch, the area between the floor and the ground. Without some kind of skirting or landscaping, you'll see exposed piers, joists, and dirt. The best way to cover this area and create incredible create curb appeal is with nice landscaping and skirting. Mary and I have lots of ideas for you here. Ever thought jazzing up the area beneath your porch? Black vinyl skirting is very popular and it looks great under porches or decks. See more black vinyl lattice options. 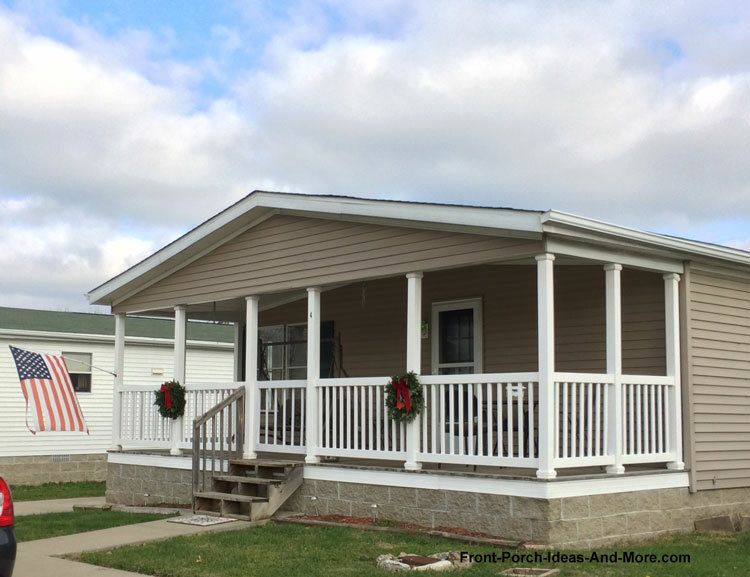 Here are a few things you should consider; however, before purchasing, making, and installing porch skirting. Ventilation: If your porch, screen porch, or 3-season room is supported above ground you will need adequate ventilation under your porch. Otherwise, moisture will collect which will hasten the degradation of your porch supports and flooring and mold will certainly grow under your porch. No matter the material you select for your porch skirting, ensure that you have adequate ventilation (error on the side of more not less). Appearance: Initially the most important consideration. 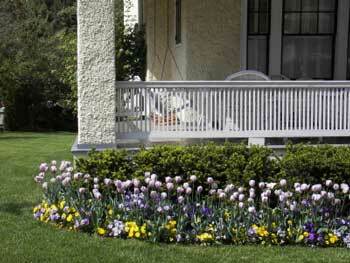 The right skirting can actually increase your porch's curb appeal. Likewise, choosing the wrong style will definitely detract. Popular colors include white and grey, but black lattice panels are gaining popularity as well. We recently discovered that Acurio Lattice Works is one, if not the only supplier of black lattice. Maintenance: The materials you choose will have certain maintenance requirements. Likewise, the cost of materials will increase in correlation to how much maintenance you'll have to do. Use our skirting materials guide below to determine how much maintenance is required. Pest Control: Depending on where you live pests can be an issue. We often hear about people have problems with skunks and other animals taking up residence under the porch. So if you live in such an area, select and install porch skirting to prevent this from occurring. See Dave's Tips below. You probably didn't know there were so many things to consider- you just wanted some skirting ideas. Nailing up some wood lattice panels may do the trick but with very little extra effort you can save yourself a lot of grief later. I can think of a lot better things to do than crawling under my porch to make repairs. For one, I'd rather be sitting on the porch watching my neighbor crawl under his. 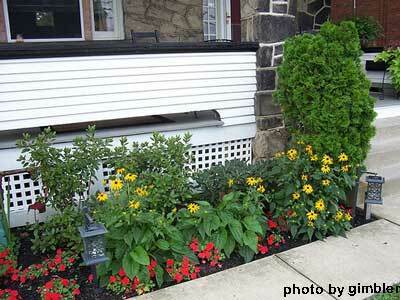 This skirting, with its checkerboard pattern, provides a charming background for the colorful landscaping. You have several porch skirting options and one of them will most likely satisfy your requirements, both for cost and appearance. It too can be painted and requires minimum maintenance. It is stronger than wood lattice, will last forever, and comes in both 4' x 8' sheets or 4' x 4' sheets. We have a fantastic picture gallery of vinyl lattice panels (see link below), courtesy of Acurio Latticeworks. You'll see some really unique designs for outdoor lattice, screen doors, and much more. You can even design your own. Vinyl lattice is sometimes susceptible to thermal contraction and expansion so you can't just nail it up. It will bend and twist - so you need to allow for expansion. Use vinyl trim pieces that are specifically made for installing this type lattice. Ventilation is not an issue. NOTE: Purchase trim (channels) for both wood and vinyl lattice panels. These are framing pieces that the panels will fit into for installation. 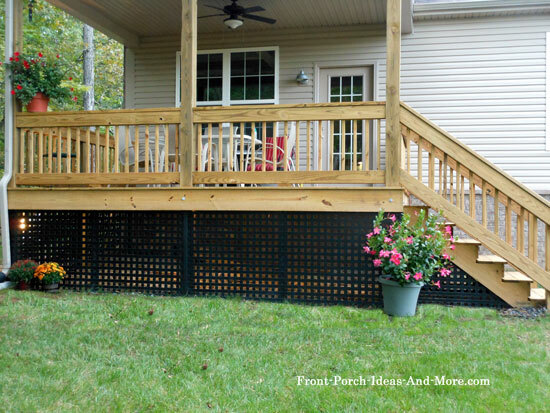 If you are looking for custom vinyl lattice panels to use for your porch skirting needs, we know who can make them for you in the size you need. 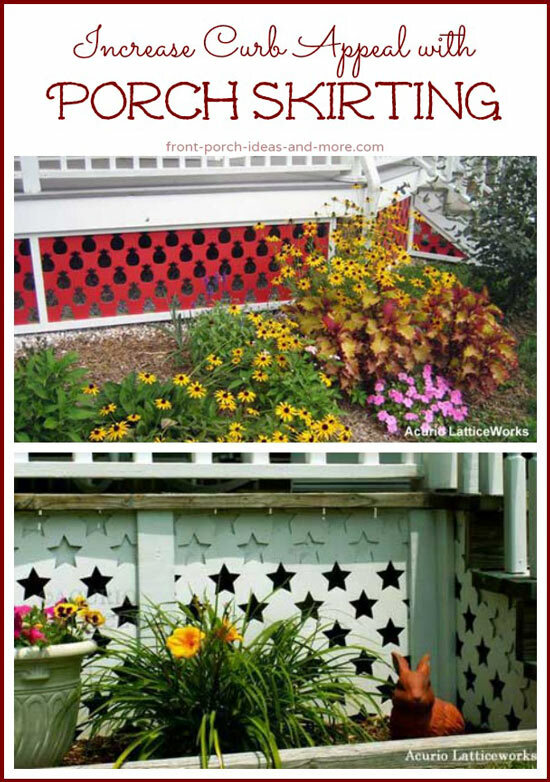 Watch our vinyl lattice panel video for ideas to use on your porch. If you love DIY projects, are fairly good with basic construction concepts, and want a weekend project consider making your own porch skirting. Use treated lumber and create your own design. You'll have limitless design options and color schemes. Just make sure you have great ventilation. Or, if you could possibly have a contractor custom make them for you. Wood degrades over time so take care in preserving your work of art. 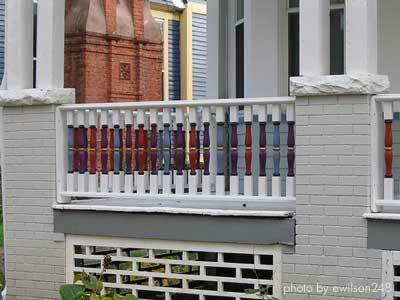 Perhaps the most common porch skirting, wood lattice panels usually come in 4'x 8'sheets. It's relatively inexpensive and fairly easy to work with. 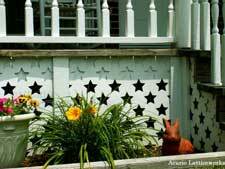 Use treated lattice panels which you can paint or stain (recommend a solid stain). Wood lattice panels expand so take that into account when measuring and installing. Even treated wood degrades over time so plan on repairing and/or replacing your skirting from time to time. Also, wood lattice panels cannot take a lot of abuse so shovels, baseballs, etc., will break the lattice. Replacing a lattice strip or two can be tedious; replacing an entire section may be a better option. Ventilation is not an issue. Not as common, but can be gorgeous and create some impressive curb appeal. I used faux stone to build a fireplace chase and it turned out fantastic. 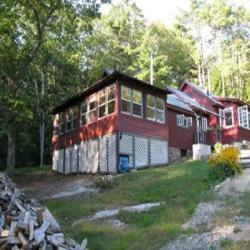 Due to the technology, a homeowner can do this project and it's worth the investigation. However, it is on the high end of skirting so it may not fit everyone's budget. In addition, you must plan for ventilation. Although not extremely common brick almost always has an aesthetically pleasing appeal (see photo below). Labor costs will be more that perhaps other types of skirting, but it requires almost no maintenance and even looks great as it ages. I'm not big on it but have seen it done. You can use a variety of woods, from exterior plywood to cedar. Ventilation is an issue so plan for several vents. Mostly used on mobile homes, metal skirting is available in kit form. Again, plan for ventilation. Whether you use landscaping alone as porch skirting or combine it with any of the above materials, you can't go wrong. Depending on the height of your porch you may be able to use landscaping totally to hide the underside of your porch. Use shrubs to form a visual barrier. Using evergreen shrubs will hide the bottom of the porch all year long. In addition, you can use a variety of plants (like hostas) to do the same. This can be an inexpensive means depending on how you obtain plants. Mary and I have gotten great landscaping plants very inexpensively at the end of the growing season. We've also split perennials, gotten sprigs from neighbors and friends to form some very nice landscaping around our homes. Or, if you desire, you can purchase shrubs and plants in sizes that will immediately form a visual boundary. 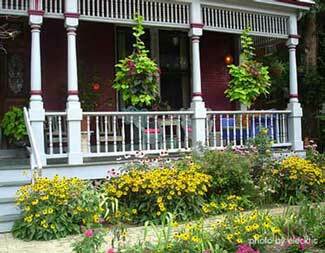 See our Porch Landscaping Ideas for more great information. The channels will have a 1/2" or 5/16" rabbit cut for which the panels fit into. Double that distance and subtract from the total distance. (For example if your opening is 4'(48") x 5'(60") and your rabbit is 1/2" subtract 1" from the total distance. The lattice panel would be 47" by 59". Remember, vinyl lattice panels expand and contract so you might want to cut your panel just a wee bit shorter. If you measured correctly and cut correctly you should be able to place the panel inside the channels and glue the channel corners together. Do not glue the panels to the channels. They should be free to move inside the channels pieces. Attach the assembled panels in the opening. Use galvanized or stainless steel screws. Repeat for the other portions of your porch. See our response to Tom's question below about framing vinyl lattice panels. We explain how it is done, what it takes, and where to get the u-channels. We gave one of our site visitors ideas for constructing lattice panels under his enclosed porch which was situated on a hillside and thought you might like to see his project. Use shrubs to form a visual barrier. Using evergreen shrubs will hide the bottom of the porch all year long. In addition, you can use a variety of plants (like hostas) to do the same. This can be an inexpensive means depending on how you obtain plants. Pest Control Tip: One way to discourage larger animals like skunks from taking up residence under your porch is to prevent them from gaining and entrance. Most like to dig a hole under the porch skirting to gain access. Prevent this by first placing or burying a piece of screen (chicken wire) at least 3 to 4 wide below the skirting. Secure it with wire staples (the kind used to secure vegetation matting in landscaping), cover it with soil, and install your skirting. They can't dig through the screen to gain access. While not 100% proof, adding porch skirting can help keep skunks out. 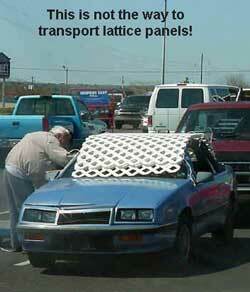 Transporting lattice panels (either wood or plastic) can be perplexing. If you are fortunate enough to have a van, truck, or vehicle that can handle a 4 x8 foot sheet - great! Throw it in and head for home. However, not everyone has a van or truck. If you are carrying the panels on the roof of a mini-van or SUV and only tie it down across the middle it will be flopping all over the place. Place two 6 or 8 foot 2x4's (or other comparable pieces of wood) on each side of the roof rack first. Then lay the panels on top. Secure the panels and 2x4s to the roof rack with straps making sure the ends of the panels are also secured to the 2x4s. Use the same method when using a sedan. If you don't have a roof rack, lay a heavy rug or piece of carpet on your roof. Use 2x4 supports, place lattice on top of 2x4s, and secure all pieces.